"Water God&apos;s Dog," by R.S. Benedict [bio] (edited by C.C. 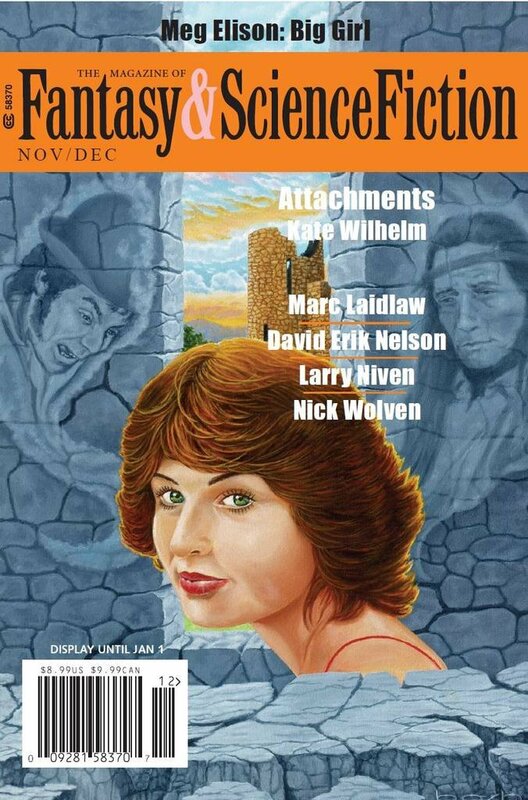 Finlay), appeared in Magazine of Fantasy & Science Fiction issue 11-12|17, published on November 1, 2017 by Spilogale Inc. Pro: Ganba clearly needs a new priest, and his choice of the boy is perfect. The boy’s father was a thief, a man who siphoned off water from others, but Ganba himself is a thief, siphoning off things from the city. The boy has little to say—just gets to the point. Ur-ena goes on and on and on. No wonder Ganba is impatient with him. Inside the depths of the temple, it's clear that Ganba has hoarded vast amounts of water, leaving his people to suffer. The story tells us this has gradually grown worse over time. But once the boy becomes the new priest, it's clear Ganba has made a fatal mistake. He directs people to dig down to the buried palace to get the water to help the people, even though Ganba is fighting him every step of the way. One can interpret this as a condemnation of capitalism or at least of any system with endemic inequality, but the message is well-enough disguised not to damage the story. Finally, the descriptions of Ganba’s underground realm are beautiful. Eveything probably has a symbolic meaning (e.g. the first gate is clearly material goods) but I don't have an interpretation for all of them. Con: It’s obvious fairly quickly that Ur-ena is all worn out, and it seems clear that the reason he hasn’t heard from Ganba in a long time is that Ganba wants a replacement. This makes the whole middle portion of the story drag. There is some tension when it looks as though the boy is to be sacrificed, but not much since everything else (e.g. Ganba's refusal to let him be harmed) argues otherwise. My interpretation was that the boy was rebelling. I also interpreted that the boy was rebelling. Then it turned out that it might be true according to the writer (link below). However, he also says that it all wanted to be an allegory. But said allegory escaped this reader completely. Like in not getting it at all. Whoa! Totally over my head. Thanks for the link. The allegory is for late-stage capitalism. I scold him. "In my youth, we had more dignity." "In your youth," he says, "You had more water. The insistence here is that the Water God is hoarding his water -- not for any gain or use; hoarding for hoarding's sake. There's criticism here of stark capitalistic dynamic in general, but most of all, it's pointing to a breaking point. When inequality grows to its uttermost extreme, the "late stage" in late-stage capitalism, then the whole system dries up -- it's not just the rich being well-off and other people less; it's that survival for the non-rich becomes increasingly impossible. Although it's worth pointing out that the Water God himself seems to have chosen the boy to bring water to his people, so Ganba himself isn't eager to be hoarding the water. The young man, Amar-Inana, is contemptuous of Ganba, hates him up to the end. And Ganba, likewise, may have chosen Amar-Inana, but he's also fighting him tooth and nail -- Amar-Inana "grips his head and faints," "can't even give orders anymore," tells his people to dig "no matter what." The elder, Ur-Ena, recognizes this as the punishing agony that Ganba inflicts upon his chosen to force them to his bidding -- that's part of the allegory too; that setting yourself against the system means putting yourself in harm and danger, first and foremost; easier to go down the path where your family is granted water and spared pain. We see plenty of instances where people beg Ganba for help, and only get a trickle of water. Always less than last year, less than the year before; maybe if we go above and beyond in catering to the Water God, he will give us half of what our fathers before us used to get. It's diminishing returns; soaring inequality; squeezing the last buck from wherever it still remains no matter who it hurts. That's what the story is about; what it's portraying. It's not about whether or not the child will be sacrificed. It's about a world that's drying up and withering away; locked into a system that gives back less and less, in return for more and more. Ganba has chewed Ur-Ena up, and is spitting him right back out, because even though Ur-Ena is a true believer with utter loyalty and concern for his Water God -- Lord Ganba simply doesn't care. Ganba wanted someone fresh and new -- and that may have worked well for generations, but *this* generation is past the breaking point. Okay, I just reread it, and I think you're right. Part of the reason I missed it is that I don't believe in "Late Capitalism" (or socialism in general), but your interpretation makes far more sense. Now I'm wondering what the special symbolism of Ganba's six gates might be. Material goods were the first, then "honored dead," then hanging gardens (where fruit with actual seeds exist), then "rain," then the vast lake (with submersible boat), and finally Ganba's chamber. Rats! If I'd realized this back in November, I'd have given it four stars for cleverness. The ending seemed straightforward enough to me: the boy and his recruits were digging down to the water god's cistern to get his water for the city. Oh! Duh! How did I miss that? Thanks! I rewrote the review after the discussion here, and after rereading the story once myself. I've raised the score to 4 stars. Even though it's too late for the 2018 Hugos, as Standback says, it will still figure in the 2019 Campbell Awards.